Mary Jane Truman, 1889-1978. Sister of Harry S. Truman, 33rd President of the United States. Rare Typed Letter Signed, Mary Jane Truman, one page, 6⅛" x 9¼”, on stationery of The White House, Washington, May 16, 1945. 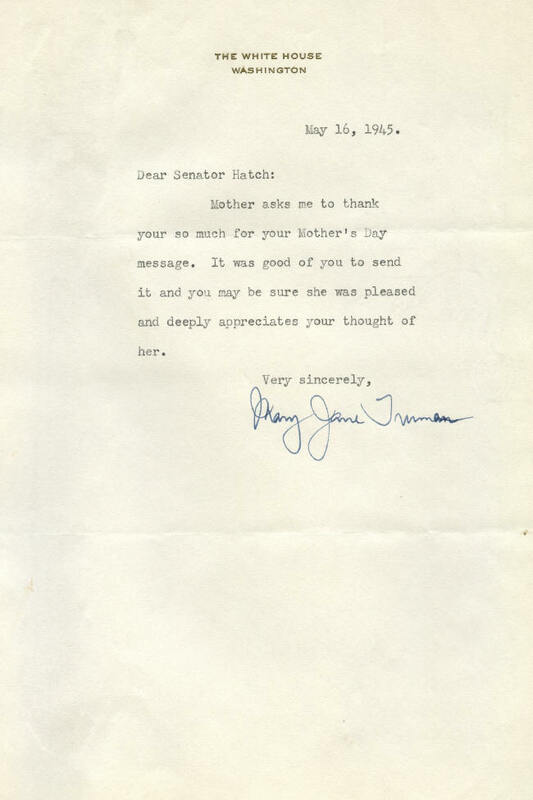 Just over a month after her brother succeeded Franklin D. Roosevelt as President, Mary Jane Truman sends a cordial note to Senator Carl Hatch to thank him for his Mother's Day greetings to her mother, Martha Ellen Truman. In full: “Mother asks me to thank your [sic] so much for your Mother's Day message. It was good of you to send it and you may be sure she was pleased and deeply appreciates your thought of her." Hatch was one of President Truman's closest friends in the United States Senate. This letter is laid down to another sheet but otherwise is pristine. It has two normal mailing folds, neither of which affects the signature. 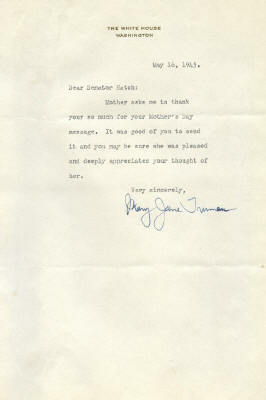 Mary Jane Truman's autographic material is rare. Our own private collection focuses on Truman material, and we can recall seeing only two other Mary Jane Truman pieces offered for sale in nearly 20 years. that we are currently offering. Click here to see first ladies' autographs.